Naviance Insights is a series of college outcome dashboards that empower educators to build a college readiness strategy on proven results. Now Available! The College, Career and Life Readiness Framework gives students in grades 6-12 a practical toolkit for mastering 6 competencies that they must achieve to be college, career and life ready. Now Available! 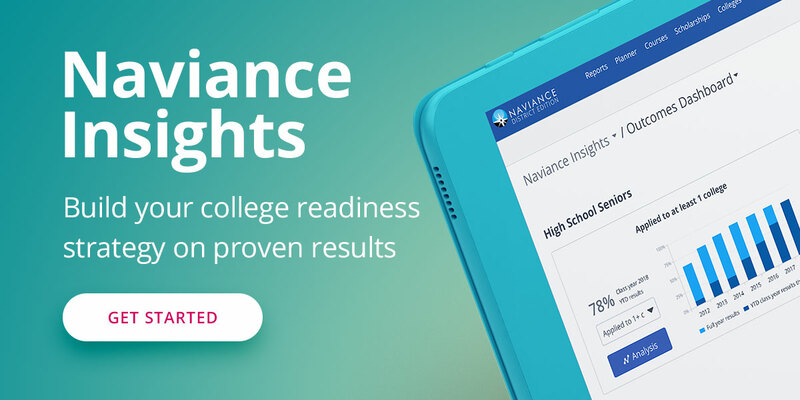 Naviance Insights is a series of college outcome dashboards that empower educators to build a college readiness strategy on proven results. Based on data such as applications, acceptance and matriculation, educators can identify trends and identify what programs and strategies are impacting the desired outcomes. Naviance Insights is available in two versions: Naviance Insights and Naviance Insights Premium. Track college outcomes and share results. Included with every Naviance subscription. Analyze college outcomes and inform your strategy. Districts and School Leaders: Watch this video for an introduction to Insights and Insights Premium. Counselors and Site Managers: Watch this video for a deep dive on Insights and Insights Premium. Several Help Library articles are available to help navigate and use the Insights Dashboards. Getting Started with Naviance Insights: This article provides information on how to use the dashboards and filter information to get to the data you need. Troubleshooting in Naviance Insights: This article provides guidance if you encounter issues using the dashboards. Each research-backed Competency outlines themes, objectives and activities to further define success for each grade-level. Skills like Digital Literacy and Goal Setting span across all the competencies and are must haves to succeed in today’s world. Visit this site for more information on the framework. CCLR Framework: The Framework provides an overview of each of the six competencies by grade level that define student success. For each grade level, the competency profile includes themes, objectives, activities, metrics and outcomes. CCLR Objectives and Activities: This resource provides an overview of the recommended objectives and activities by grade level for each of the six competencies. CCLR Presentation: This presentation can be used with your staff to introduce the framework and the activities/objectives you intend to manage by grade level.